A BOSCH Geothermal Heat pump use the relatively constant temperature of the earth to provide heating, air conditioning and hot water. Geothermal Heat Pump systems are the most energy and cost efficient systems on the market and therefore the greenest technology for heating and cooling. The technology uses the relatively constant temperature of the earth (thermal energy) to provide heating, air conditioning and hot water. Ground and water temperatures, 6 feet below the earth’s surface, stay relatively constant throughout the year. This allows the system to provide extremely efficient heating or cooling all year long in virtually any climate. Sometimes the term “environmental comfort system” is used to describe a geothermal heat pump. This happens because a heat pump absorbs or rejects heat from the earth and has absolutely no impact on the environment. 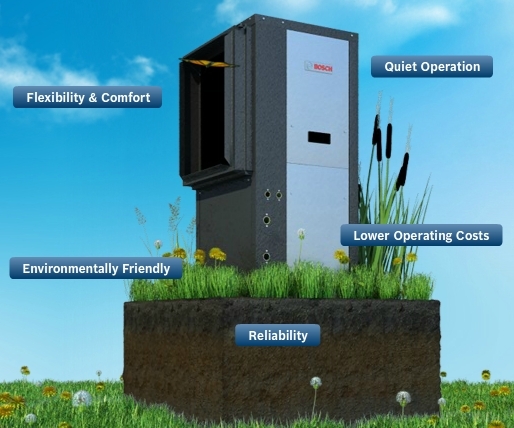 To learn more about BOSCH Geothermal Heat Pumps click here.